Two awardees have been presented with the 2017 William T. Pecora Award by the USGS for achievements in Earth remote sensing. Darrel L. Williams, Ph.D., is being recognized for his individual contributions as a catalyst behind many innovations for the Landsat program. The International Charter on Space and Major Disasters, a group of 16 agencies, is being recognized for providing satellite earth observations to help save lives and protect property worldwide. Sponsored by the USGS and NASA, the annual award is being presented today at a special commemorative event at the Pecora 20 conference. The award has been presented annually since 1974 and honors the memory of William T. Pecora, Ph.D., former director of the USGS and under secretary of the Department of the Interior. Dr. Pecora was a motivating force behind Secretary Udall’s 1966 announcement for the establishment of civil remote sensing of the Earth from space. Darrel L. Williams, chief scientist for Global Science and Technology, is being recognized for outstanding contributions to understanding the Earth through remote sensing. He retired from NASA in 2010, following a distinguished 35-year career primarily focused on the Landsat program. He was the catalyst behind many new innovations for the Landsat 7 mission. For example, he helped improve the quantity and quality of imagery by comparing simultaneously acquired Landsat 5 with Landsat 7 data for cross-calibration between the two satellites. Williams played an instrumental role in the development of the Landsat 7 long-term acquisition plan to ensure that a robust, global and seasonal archive was acquired. Two significant examples include a global archive of coral reefs and the acquisition of Landsat imagery of Antarctica, leading to the highly acclaimed Landsat Image Mosaic of Antarctica. After discovering that Landsat 5 wasn’t conducting routine orbit adjustments and scientists were faced with potential degradation in data, Williams was critical in ensuring the issues were remedied. Landsat 5 went on to function another 17 years and acquire over one million additional images. Currently, as chief scientist at Global Science and Technology, he has explored innovative approaches to follow-on Landsat missions and continues to support completion of the soon-to-be-published Landsat Legacy study, which documents the definitive history of the Landsat program. Williams is a graduate of Pennsylvania State University and the University of Maryland. 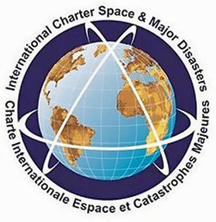 The International Charter on Space and Major Disasters is being recognized for providing free satellite imagery, data and information to the global community during times of crises. The Charter has changed the way civil protection agencies respond to disasters. Satellite imagery allows decision makers, rescue teams and responders to quickly determine available routes to victims, move them to safety and select the best locations for rescue efforts. Since the Charter was founded in 2000, response efforts include the massive 7.9 magnitude earthquake in Nepal in 2015; the devastating Typhoon Haiyan in the Philippines in 2013; the major earthquake in Haiti in 2010; the massive Deepwater Horizon oil spill in the Gulf of Mexico in 2010; the tsunami in Indonesia and Thailand in 2004; and over 500 other disasters spanning the globe. The Charter has 16 member agencies that provide satellite, data processing and data distribution assets. The wide range of satellites operated by members helps ensure rapid coverage of the Earth and provides an invaluable source of near-real-time information. This humanitarian mission is valuable to communities who are exposed to an imminent risk or are already victims of natural or technological disasters.